Jungle container camp. Photo provided by author. All rights reserved.The ‘jungle’ in Calais is a space of both transience and persistence. This refugee settlement located on a wasteland just outside of Calais in France hosts more than 6,000 refugees who wait for an opportunity to cross the Channel to the UK, stowing away on a truck, car, ferry or train via the port or Eurotunnel. It is at once an informal encampment of makeshift shelters; a town under construction, with shops, restaurants and schools; and, a space subject to institutional violence and at risk of imminent destruction. At the beginning of February, French authorities bulldozed a mosque and a school, having previously promised it would leave these buildings untouched. This was not the first systematic destruction of parts of the jungle: in January, the authorities gave residents a few days’ notice to move their shelters before clearing a 100-metre strip of land. This so-called ‘no-man’s land’ was said to be a measure of security – a ‘buffer zone’ to restrict refugees from easy access to lorries on the motorway. Access to the motorway had already been restricted by means of a tall white fence donated by the UK government (and previously used at the London 2012 Olympics). The term ‘no-man’s land’ as well as the contention that the jungle is a ‘completely unpoliced space’, as recently claimed by Kevin Hurley, former counter-terrorism chief at the City of London, are an indication of the struggle over this refugee space. In addition, these terms are indicative of the spatial contestation this involves. Whilst notions such as ‘unpoliced’ and ‘no-man’s land’ suggest a place of danger and without community, it is precisely because the jungle is more than a temporary stopover that it has become a dangerous place to live for refugees. The fact that it has turned into a lively town hosting a diversity of communities is at least one of the reasons that the French authorities are keen to get rid of the jungle. Put differently, the fact that it has turned into a lively town hosting a diversity of communities is at least one of the reasons that the French authorities are keen to get rid of the jungle, and using increasingly violent means to do so. This fourth piece in our series, ‘Transit points and enduring struggles’, documents the struggles over the transience and persistence of the jungle as an informal yet securitised border zone. In short, it can be said that the jungle is a space of continuous change, where people come and go, and which keeps changing in character due to practices of refugees, activists, aid organisations and government authorities, where these actors seek to ensure its transience and persistence in conflicting ways. Yet, whilst both the French and UK governments regard it as a problem to get rid of, it is in large part due to the very migration management policies of these governments – such as increasingly advanced border controls, fences and technologies – that the jungle emerged in the first place, and has become a permanent space of transit and residence. Yet, if it was thought that the push away from local amenities to a space that seemed uninhabitable would deter refugees from staying in Calais, the authorities were soon proved wrong. During subsequent months the area defined in terms of ‘waste’ turned into a town under rapid construction. Today, the jungle is a town with streets, including a main street with shops and restaurants, and bars that play music in the evening. There are schools, mosques, churches, a library, a youth centre; and, there are different neighbourhoods, which are organised on the basis of nationality/ethnicity. It must be stressed that, as a town, the jungle is far from perfect and can be described as a humanitarian crisis: the streets are muddy; living spaces are makeshift and unheated; sanitary conditions are poor and insufficient; and there is physical violence, too. Despite these conditions, due to the efforts of refugees, activists and aid organisations a lively town has emerged that is looking increasingly permanent. 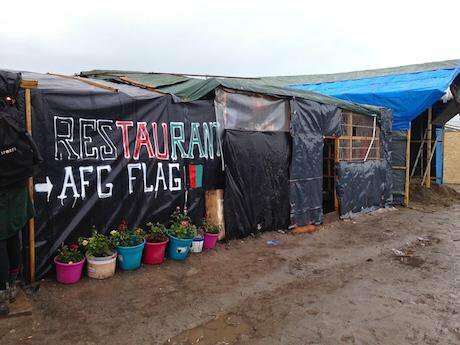 In this respect, the persistence of the jungle is a result of eviction from the centre of Calais to a space of ‘waste’, in combination with informal networks of organisation and governance that have turned it into something rather different. At the same time, the jungle is a space of transience in the sense that people come and go. Most of its inhabitants are there because they want to get out of France and into the UK. In addition, people come and go in the sense of being detained and released by French authorities. There is a high turnover of living spaces as well. Whilst shelters are destroyed due to poor weather, accidental fires or police intervention, new living spaces continue to be built. If you return to the jungle after a few weeks or a month, it looks like a different place. Moreover, between the summer and the autumn of 2015, its population increased from 2,000-3,000 to more than 6,000. There is another reason for the transience and persistence of this town: the border regime and the violence that accompanies it. In October 2015, the French government announced its intention to reduce the number of refugees in the jungle to 2,000 and to build a more permanent structure to accommodate them. It has pursued this aim partly through tactics of intimidation and by means of increasing police presence and violence, both in and around the jungle itself and at the ferry terminal and Eurotunnel. The notions of a ‘completely unpoliced space’ and a ‘no-man’s land’ seem rather poor descriptions in this context. At least up until the summer of 2015, police would not enter the jungle, although they would guard other spaces, such as the ferry terminal. After the summer, police patrols began in the jungle and officers were stationed at the entrance. In the wake of the November 2015 Paris attacks, police presence and activity further increased. Towards the end of the year and at the beginning of January, these new “security” policies, purportedly to stop refugees from climbing into lorries, included heavy-handed attacks on the jungle during the night, including the use of tear-gas and rubber bullets in residential areas. This was followed by the first eviction that created the 100-metre ‘buffer zone’ in January. Rather than a ‘no-man’s land’ this open space gives the police better visibility of the jungle and hence enables intervention. Put differently, it is a space of control and securitisation. However, in character with other spaces of the jungle, this is also creatively contested. The strip of open space has also become a ground for organised football games for youngsters living in the jungle. The authorities’ intention to contain the jungle both spatially and numerically is pursued through a combined strategy of destruction, transfer and dispersal. Presented as a sustainable solution, one policy that ensures both the persistence of the jungle as well as its destruction is the creation of a new camp consisting of converted shipping containers, which could accommodate 1,500 people in total. 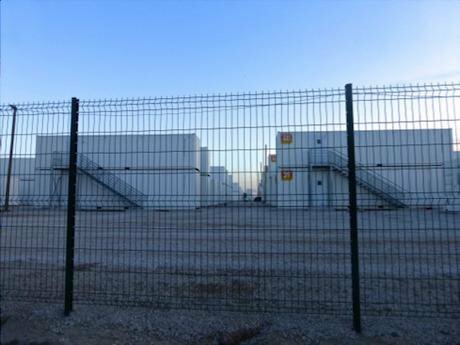 These containers do not have any facilities apart from six bunk beds each – offering space to 12 refugees – and heating. Registration is required in order to move into the containers and access is restricted by palm prints. Of course, refugees are wary of this kind of biometric identification, fearful that it might jeopardise a future asylum claim in the UK. In addition, the lack of facilities and the fencing around and controlled entrance to the camp make it look more like a prison than a comforting living space. Thus, besides the great sarcasm of accommodating people unable to cross the sea in shipping containers, it also constitutes an effort to destroy the more autonomous community spirit that characterises the jungle as a town. On 12 February, the authorities announced a new round of evictions. This time, it concerned the southern half of the jungle, which, the authorities claimed, would affect 800-1,000 refugees, 750 of whom would be able to move into the container camp. Aid organisations and activists swiftly disputed these numbers, arguing that many more people live in this area, which also hosts a women and children’s centre, a newly opened youth centre, mosques, schools, a church and a library. In an unprecedented move, the organisations conducted a census, first of the southern part and then of the jungle as a whole. They found that – as a conservative estimate – 3455 people currently live in the eviction area, including 455 children, 305 of who are unaccompanied. The total number of residents is 5497 (this excludes people living in the container camp and in the Jules Ferry centre, which hosts 500 women and children). This knowledge is currently employed to challenge the eviction plans in court. Whilst the census can be seen as a form of counter-knowledge to prevent further violence and intrusion on behalf of the authorities, producing data about a collective group of people can also function as a tool of governance and control. Yet, the census is interesting not only because it contests the numbers presented by authorities, thus enabling a legal challenge to the claim that most people evicted could move into the container camp. It is also interesting as the first attempt to record the number of jungle residents. Whilst the census can be seen as a form of counter-knowledge to prevent further violence and intrusion on behalf of the authorities, producing data about a collective group of people can also function as a tool of governance and control. That is to say, it helps to create a ‘population’ that can be governed. As Foucault reminds us, it is by making things knowable – e.g. through a census record – that governance becomes possible. Hence, paradoxically, in an effort to save the autonomous space of the jungle and to avoid the more intrusive databasing techniques of the container camp, those in support of the refugees have resorted to creating a form of counter-knowledge that might nonetheless become part of future governance and policing techniques. In this sense, knowledge of the number of residents is of less significance than the political implications of creating (counter-)knowledge. The number of people living in the jungle changes on a daily basis, yet the creation of numbers constitutes a political stake in the persistence and transience of the jungle. This political question closely interacts with another paradox and political stake: by attempting to make the jungle transient – to get rid of the ‘problem’ – the French authorities are actually ensuring its persistence. They do so, firstly, by building more permanent shelters. Even if these consist of prison-like conditions, this does not mean that this space cannot be reappropriated in creative ways. Secondly, ultimately, the jungle is becoming more and more permanent because the border is becoming more and more difficult to cross. The fencing up of Calais – in the jungle and at the port and the Eurotunnel – as well as increasingly advanced border control technologies will only make the presence of refugees and the existence of the refugee town more permanent.